The foundation of world time is the establishment of standard time. The rapid development of navigation and railway industry in the 19th century made transnational trade very frequent, and many large trading countries had set up "standard time" on their own. The United States, a country that actually spans multiple time zones, has had problems with jet lag, including heavy train crashes. In 1884, the United States proposed and organized the international meridian conference, aiming to establish a world standard time and to establish a global standard of time. With a complex function and a set of special structure, the wrist watch has taken a lot of thickness, which is as thick as the common timing clock. Of course, the thickness of 12.36 mm isn't hyperbole, still in the ideal size range of ordinary watches. The composite grinding design combined with polish and brush, make watches improved in the overall quality. Only brushing is masculine straightforward, blindly polishing is a polite, both combination, it is the most ideal characteristics of wristwatches. From the angle of the back side, the ingenious design of the lug can be clearly seen. It fits and the outside curve of the watch band well. The benefit is that the strap can be very naturally fit your wrist when wearing so as to improve wearing feeling. The sea eagle wrist watch uses the sun pattern as the dial base line, elegant and generous. 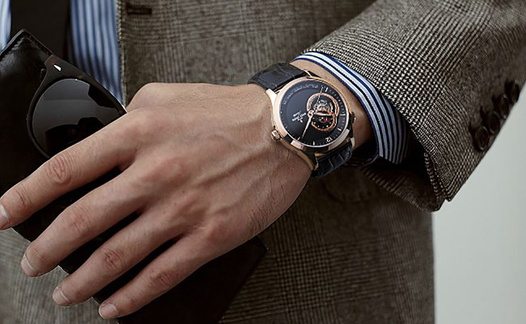 The dial uses three independent and integrated round designs to wish your career, love, family completeness. 9 o’clock tourbillon small second. At 6 o 'clock, the tourbillion on the carved plywood is the soul of the whole wristwatch, while the 24 hour pointer on the flywheel keeps turning with the passing of time, and the design is interesting. In order to focus the visual on the tourbillon, the sea eagle wrist watch is marked with the track type, and the super luminous clock is matched with the 9 o’clock tourbillon. The time scale is convex on the dial, showing a multi-depth, multi-level visual effect. Different from the ordinary sapphire glass, sea eagle watches use a high technological twin bridge sapphire glass. The middle part of the glass is the thickest and then to the edge thinning, and with anti-dazzle process, pervious to light clear, let the exquisite dial show in sight perfectly. 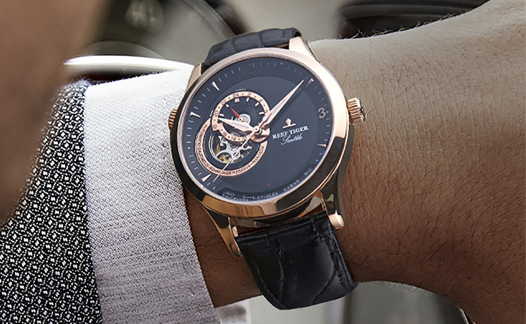 The technical core of this watch is that it is equipped with the RT3900 series of transparent pendulum movement. The whole flywheel is completely exposed; the exquisite operation posture is so eye-catching and amazing. 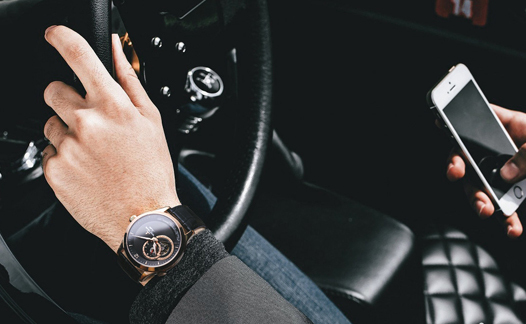 All the rose gold styles of the royal crown watches are plated with 10um genuine gold plating. Such a thick layer of electroplating ensures that the wristwatch is timeless and will never fade. The watch is designed with a spiral crown. The design of the flat round crown is unique and novel. The design of the crown makes the crown very decorative. Unlike most watches, the wristwatch's crown has more missions, not only with the function of winding and adjustment, but also the function of adjusting the dial 24 hours day and night. To this end, the design of the crown is exquisite; the top of the line is slightly domed processing, so the feel of the hand can be a point. 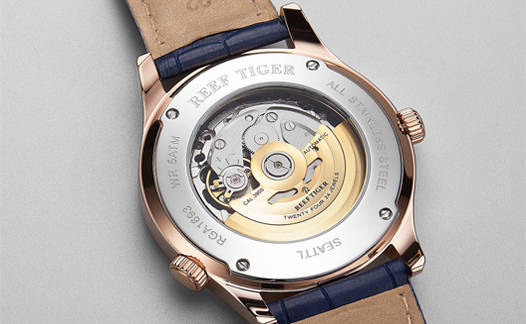 The royal crown watch is paired with Reef Tiger's unique size pattern band and is fitted with a specially designed butterfly clasp. The strap is soft and comfortable. 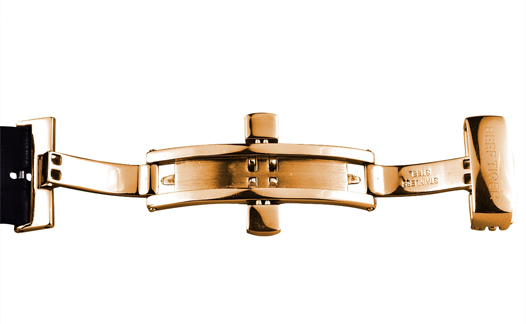 The lines of the buckle are smooth and graceful, showing delicate elegance and taste.